The catalogue “The World of Lapp” is available as an app that can be downloaded for tablet computers. 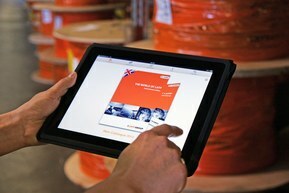 The “Lapp catalogue app” is available for iPads and Android tablet computers in English, Spanish, Czech,Italian and German. The app can be downloaded from the Apple App Store or the Google Play Store. Users can then utilize their tablet computer to explore the world of Lapp, including a wealth of branded products, technical tips and services, without needing to be connected to the Internet. The “Lapp catalogue app” enables you to find the right products for your requirements quickly and easily.